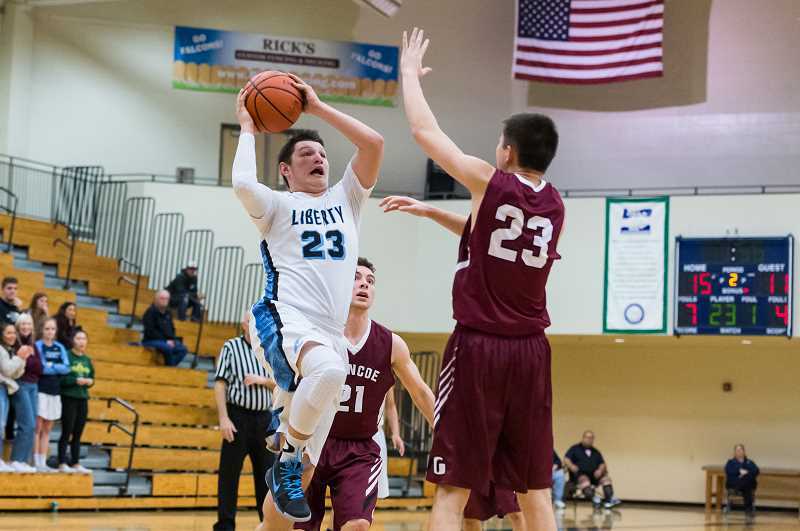 An increased level of athleticism should result in more pressure from Liberty this season. Despite losing a number of their key players from last season's team that lost in the state playoffs' first round to Jefferson, the Falcons return a couple starters, a few more key reserves and a lot of pure athletes that they hope to unleash on Pacific Conference competition early and often this season. "Last year, our strength was in the guard play, but this year, we're bigger, stronger and more athletic, so I think that's where we excel," said Liberty head coach Brian Martin. "We're going to try and create more pressure, going to make things harder on our opponents defensively, and we're going to pound it into our bigs." The Falcons opened the season with a narrow 65-60 defeat to Westview, but Martin was encouraged by what he saw from his team, even playing without standout guard Aiden Maloney. "It was a great first game for us," Martin said. "Our guys battled, and our kids can physically compete with teams like that now." Martin's team returns junior guard Tyler Rockwell, senior post Trevor Walker, Ethan Moody and senior wing Trevor Boyce, who the coach feels is the best shooter on the team. In addition, Martin is excited by the addition of Maloney, who sat out last season, and 6-foot-4 junior wing Marquis Brown, whom the coach said made tremendous strides during the offseason. "He's tough, strong and will be a big time player for us," Martin said of Brown. Rockwell, who saw significant time as a sophomore last season, also worked hard on his game over the summer and will be counted on to carry much of the load for Liberty on offense, defense and in the huddle as a leader — something he wasn't asked to do last year. "Tyler is going to be important to us and, this year, needs to be a leader," Martin said. "He's a good scorer and has developed a good post game, but his leadership will also be important to us this year." The coach feels that — with the addition of Maloney and a handful of other athletes who joined the team this year — one of his team's strengths will be an increased level of athleticism, which will allow the Falcons to pressure more, which in turn will lead to more easy baskets. Last season, the Falcons did most of their scoring in the half-court, and as a result, they were forced to work hard for everything they got. Contrarily, that heightened level of speed can lead to an increased level of turnovers — something they're working hard to avoid. "Because of our athleticism and because we want to play fast, we have to value the basketball and not get too quick," said Martin. "If we do that, we should be in good shape." Martin thinks his team learned a lot from its recent stint in the Metro League, where he said teams like to hit you hard with pressure. As a result, he hopes to bring a little of that Metro League mentality to the new Pacific Conference, where he expects a hearty challenge from a feisty group of teams and a very experienced group of coaches. "It's a good league and very well coached," Martin said. "What I'm telling our kids is that Liberty can compete with all these teams and they need to believe that. It's going to be a really exciting season for everyone." The Falcons traveled to West Salem for a game with the Titans Tuesday, Dec. 4, after this paper's print deadline, and will host Southridge Friday, Dec. 7, at 7:15 p.m.